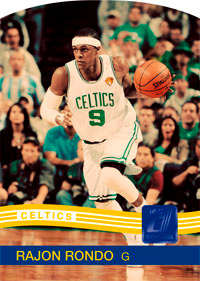 Panini's 2010-11 Donruss Basketball will mark the first time the legendary brand makes an appearance on the hardwood as well as provide basketball card collectors with a welcome change of pace from Panini's typical futuristic styled card offerings. Donruss delivers 3 hits, 20 die-cut parallels, and plenty of intriguing Rated Rookies per box. 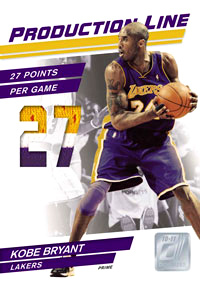 The first "Rated Rookies" in basketball card history featuring John Wall, Evan Turner, Wesley Johnson, DeMarcus Cousins, Derrick Favors and all the key rookies from the 2010-11 NBA Season! 295 card base set with 295 card parallel base set! 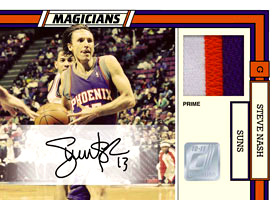 Set pays homage to 1980's Donruss cards! 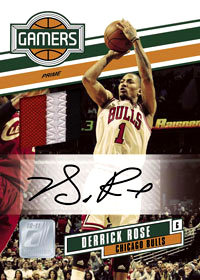 Product marks first time a basketball product will feature the Donruss brand name! 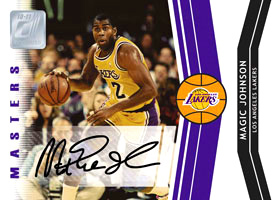 Autographed cards featuring Larry Bird, Magic Johnson, Steve Nash, Kobe Bryant, Carmelo Anthony and a host of other basketball legends past and present! Anyone else think this product looks as awesome as I do? 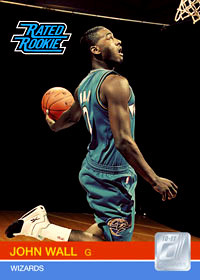 I can’t wait for the return of the Rated Rookie!! A welcome change from the same-old-same old that Panini has been churning out.